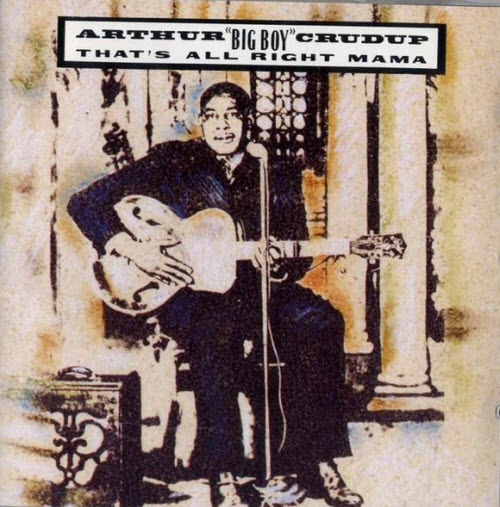 The song was written by Arthur “Big Boy” Crudup, and originally recorded by him in Chicago on 6 September 1946, as “That’s All Right”. It was released as a single on RCA Victor 20-2205, but was less successful than some of Crudup’s previous recordings. In early March 1949, the song was re-released under the title, “That’s All Right, Mama” (RCA Victor 50-0000), which was issued as RCA’s first rhythm and blues record on their new 45 rpm single format, on bright orange vinyl. 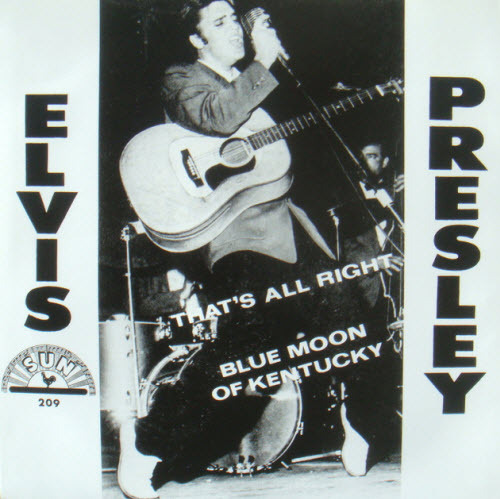 Elvis Presley’s version was recorded in July 1954, and released with “Blue Moon of Kentucky” as the B-side. Its catalogue number was Sun 209. The label reads “That’s All Right” (omitting “Mama” from the original title), and names the performers as Elvis Presley,Scotty and Bill. 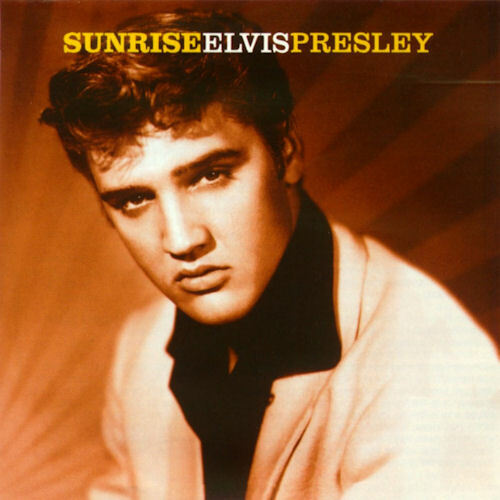 Arthur Crudup was credited as the composer on the label of Presley’s single, but Crudup had to wait until the 1960s when he received an estimated $60,000 in back royalties. Crudup used lines in his song that had been present in earlier blues recordings, including Blind Lemon Jefferson’s 1926 song That Black Snake Moan”. During an uneventful recording session at Sun Studios on the evening of July 5, 1954, Presley, Moore, and Black were taking a break between recordings when Presley started fooling around with an up-tempo version of Arthur Crudup’s song “That’s All Right, Mama”. Black began joining in on his upright bass, and soon they were joined by Moore on guitar. 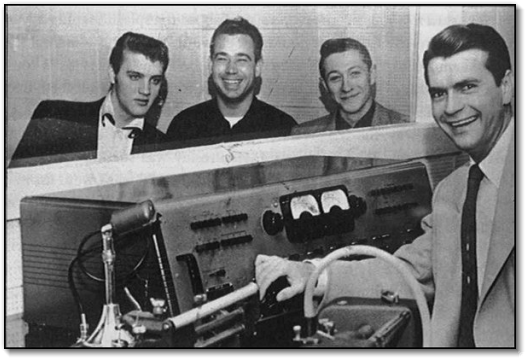 Producer Sam Phillips, taken aback by this sudden upbeat atmosphere, asked the three of them to start again so he could record it. Black’s bass and guitars from Presley and Moore provided the instrumentation. The recording contains no drums or additional instruments. The song was produced in the style of a “live” recording (all parts performed at once and recorded on a single track). 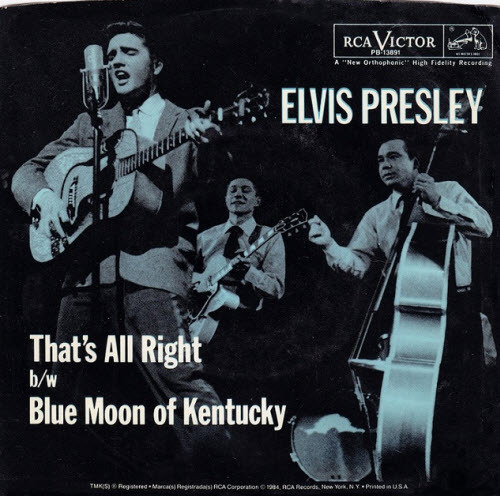 The following evening the trio recorded “Blue Moon of Kentucky” in a similar style, and it was selected as the B-side to “That’s All Right”. 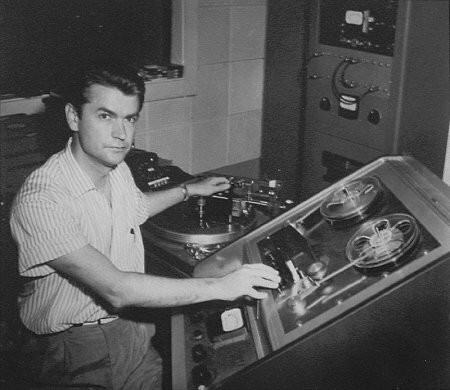 Sam Phillips gave copies of the record to local disc jockeys Dewey Phillips (no relation) of WHBQ, Uncle Richard of WMPS, and Sleepy Eyed John Lepley of WHHM. On July 7, 1954, Dewey Phillips played “That’s All Right” on his popular radio show “Red, Hot & Blue”. Interest in the record was so intense that Dewey reportedly played the record 14 times and received over 40 telephone calls. Presley was persuaded to go to the station for an on-air interview that night. 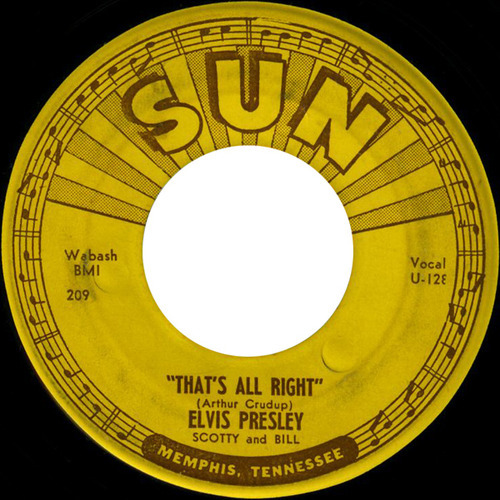 “That’s All Right” was officially released on July 19, 1954, and sold around 20,000 copies. This number was not enough to chart nationally, but the single reached number four on the local Memphis charts.